Glamorgan assistant coach Robert Croft is hoping his two west Wales spin-bowling protégés can combine with the ball as well as the bat. 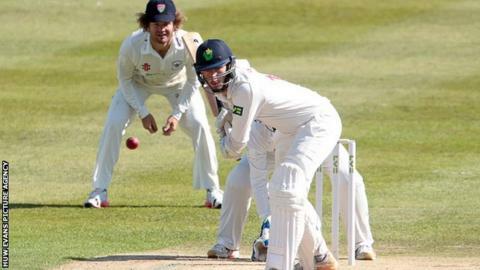 Andrew Salter (73 not out) and Kieran Bull (21 not out) added an unbeaten 85 for the ninth wicket to steer Glamorgan to 271-8 against Gloucestershire in the County Championship at Swansea. "He's coming along nicely," said Croft of 22-year-old Salter. "Not only is he a good spin bowler but he's shown that he can score runs." Croft added: "That is such a boost for us as a team when you're selecting a side, you're picking an all-rounder." Jacques Rudolph (68) was the only other significant score as Glamorgan lost wickets regularly on the first day until the start of the final session, with Gloucester seamer Liam Norwell claiming three victims. "It [the Salter-Bull partnership] puts a little bit of gloss at the end of the day, hopefully this pitch will give some seam movement and deteriorate to the point where the two off-spinners come into the game," Croft told Radio Wales Sport. Salter is a former Cardiff MCCU player while Bull, 20, is going into his third year at Cardiff Met and has also been playing for the combined Universities side known as the Crimson Caps. "I thought we worked quite well together, tried to keep it simple and I think Bully did a great job when the new ball came on," Salter said. "It was tough and it was nipping off the pitch, so there were good signs for us in that aspect. It's a different game when you come in and the ball is old and the [opposition] players are a bit more tired." Salter is optimistic he can add more runs and wickets to his contribution on day two: "It's a bit of a weird one because you face some balls and they spin and bounce, and you think 'this is tricky'. "But I'm looking forward to bowling on it myself and hopefully Bully and me can get some wickets. "It's a lovely ground and I've got fond memories of making my debut here - we should get more games west!"